WHY CERTIFY? Studies indicate 84% of employers rely on certifications to improve the reliability and efficiency of their information security teams. Delivered in partnership with PearsonVUE, the Certified CyberSec First Responder cyber security certification exam does just that. Those who pass the 100 question exam will demonstrate that they have what it takes to combat a growing cyber threat. The CFR cyber security training program will develop the skills professionals need in the real world. 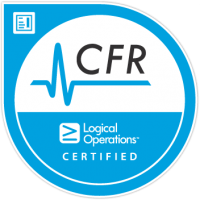 Delivered over five days, CFR utilizes an immersive lab environment, hands-on activities, and a digital learning platform with curriculum-rich content to ensure every student is equipped with the skills necessary to immediately strengthen their organizations’ cyber security defenses.